Instant Pot Korean Beef Bowls, a 30 minute meal with tender beef cooked in a sweet spicy korean sauce. This easy instant pot recipe is served on a bed of cauliflower rice with mango and avocado! Turn your Instant Pot onto the Sauté setting and let it heat up. Add Sesame Oil to the Instant Pot. Next, add sliced flank steak to the Instant Pot and brown it. (you may need to do this in two phases) Once the meat is browned, remove from the Instant Pot and place on a plate. Next add the minced garlic and fresh ginger to your Instant Pot and sauté it for 30 seconds. Then add in the tamari, beef stock, honey, rice vinegar korean gochujang paste (or sriracha) and red pepper flakes. Stir until well combined. Transfer the browned beef back to the Instant Pot. Seal the lid. Switch the Instant Pot over to the pressure cooker setting and set timer for 10 minutes. When it’s finished, use the the Quick Pressure Release method. Remove the lid once the pressure is completely released. Switch the Instant Pot back over to Sauté setting. To a small bowl add 3 tablespoons of water and 1 1/2 tablespoons of arrowroot. Whisk together and pour back into Instant Pot. Stir it constantly until the sauce is thickened. 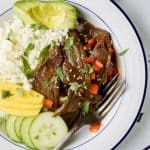 Serve your Korean Beef over cauliflower rice with sliced mango, avocado, cucumber and diced red pepper.